A mysterious structure located on the northern edge of the beach and on the western edge of the now silted harbor of Patara has been under excavation. 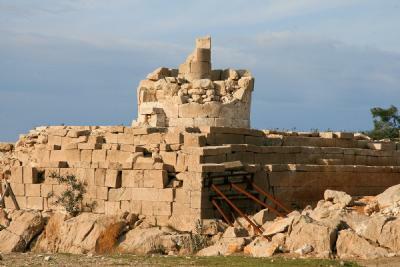 In most of the reports this structure has been called a “Lighthouse.” It is dated to about A.D. 60—for the name Nero has been found on the significant remnants of the circular inscription that surrounded this structure. It is claimed by some that this is the 'oldest preserved' lighthouse in the world! Paul and Luke changed ships at Patara as they traveled to Jerusalem at the end of Paul's third journey (Acts 21:1-3). For a recent (Sept 30, 2009) article on this find Click Here. To view a map and descriptive comments on Patara, and 27 images(! ), Click Here.